I personally know several combat veterans, and I cannot apply a single pigeonhole notion of PTSD to any two of them. For this reason I’m increasingly alarmed to hear PTSD in and of itself used as a cause to issue restraining orders, as purpose for abandoning a spouse, and, perhaps most damning, as reason to not hire a vet, singly or as a class. Shakespeare's portrayal of PTSD On Stage? 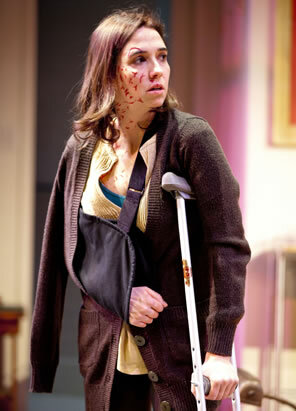 Metheny Theatre, Studio Theatre, Washington, D.C.
Holly Twford as Sarah in Time Stands Still. Photo by Scott Suchman, Studio Theatre. The closest I’ve come to combat as a journalist was covering a Jacksons concert (nee, the Jackson Five) in 1981. I was in the standing crowd on the arena floor about ten feet from the stage. When Michael sang “She’s Out of My Life,” the woman behind me started screaming, “I’ll be in your life, Michael!” and lashed out with punches on the only thing available to her: my shoulders and back. Given the circumstances, my best tact was to accept the abuse and hope Michael would cut his soulful hiccups and quickly finish the song. The closest wartime experience I’ve had was covering Hurricane Hugo in 1989, sent by my newspaper to the fishing village of McClellanville, S.C., the community hardest hit by the storm. I saw for myself how the surge literally raised the dead in a cemetery. I talked with people who had evacuated to a high school, a designated shelter, and spent the night putting their children in the ducts above the ceiling while they stood on the desks to keep their heads above the snake-infested waters. U.S. Marines came in to assist McClellanville in the cleanup. The hurricane had layered mud on the town, and that mud was now dirt, and the Marines’ armored vehicles rumbling down the street kicked the dirt up into a haze of dust settling on the shells of large homes, their windows blown out, their frames battered, their yards littered with debris, their occupants shell-shocked. Standing there as the Marines passed by in this landscape devoid of color, I felt like I was in an old newsreel footage of U.S. soldiers moving through a ravaged Normandy village in World War II. I don’t re-tell these to claim them as parallel experiences to those of real war correspondents. In fact, I’m heading in the opposite direction; I’m showing how far my experiences are from those of my colleagues who have actually covered wars on the front lines. It was with this little affinity but much respect that I watched Time Stands Still, Donald Margulies’ pointed yet entertaining play about a freelance war correspondent and a combat photographer after their many stints covering combat in Iraq, Afghanistan, and other hot spots. 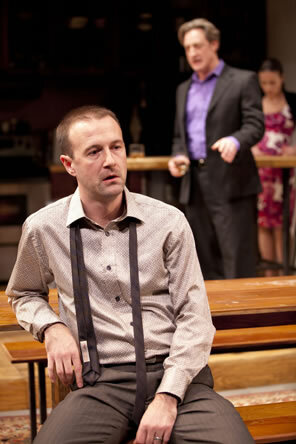 The play sets them in their Brooklyn apartment: James (Greg McFadden) recovering from a psychiatric breakdown brought on by experiencing indescribable horrors (even though his occupation is to describe any and everything), Sarah (Holly Twyford) recovering from the crippling wounds of an improvised explosive device blast that killed her interpreter. She, like James, shows the effects of post-traumatic stress disorder and she likely suffered traumatic brain injury, but she still has the urge to return to the adrenaline-pumping experience of photographing combat. Richard (Dan Illian) is their caring editor and longtime friend, and Mandy (Laura C. Harris) is Richard’s new, blatantly young and naïve girlfriend (but don’t get too comfortable in your reading of that). This is a strong cast performing a poignantly funny script in a fine production. However, my ultimate purpose in both seeing Times Stand Still and writing about it on Shakespeareances.com is to get a few things off my chest, to express publically issues that are personally dear to me. The play itself argues the validity of my intent. In one scene, James ranted about how much he hated a recently seen theatrical production about atrocities in the Middle East. He cited the disconnect between the drama on stage and the people and circumstances he himself had experienced in real life. “People trick themselves into thinking they’re having an authentic experience when it’s completely manufactured,” he said of the play’s audience. “Hell on earth made palatable—packaged—as an evening’s entertainment.” When Richard suggested that the play at least educated the audience, James countered that the people attending it weren’t the ones needing educating. “The ones who should be seeing it, the mujahideen and the Taliban, let’s face it, don’t get to the theater much.” So, in that vein, I’m extending the experiences touched on in Times Stand Still to an audience that, like Mandy, only goes to theater that has not chance of being depressing or, like many Shakespeareances.com readers, only attend Shakespeare plays. Shakespeare, as far as we know, never experienced war. His portrayals of combat tended to be gloriously brave or comic. His attitude toward war was at times jingoistic but in other instances came across as negative. Of course, it all depended on his characters’ outlooks more than his own. Meantime, it would be purely speculative to read PTSD into any of his characters. Yet, the recent production of Othello at the Folger at least raised the possibility of PTSD being part of Othello’s psyche, even if Shakespeare didn’t intend it. I’m conscious of Richard III’s behavior—not his evil but his hyperactivity, his need for combat to feel satisfaction. “Since I cannot prove a lover, to entertain these fair well-spoken days, I am determined to prove a villain and hate the idle pleasures of these days,” he says in his opening soliloquy of Richard III. Sure, he points to his deformity as the root cause of his evil (and yet immediately sets out to woo Lady Anne, proving himself a lover), but this need to be always fighting is also characteristic of him in the Henry VI plays that come before this Richard III sequel. This trait has been reported in soldiers and Marines who have experienced the adrenaline rush of war and feel aimless without it; it’s a trait Sarah displays in Time Stand Still. I’m also made curious by the behavior of the Milanese and Neapolitans on Prospero’s island in The Tempest; the depression (the king’s moroseness, the brothers’ open callousness) and the distraction brought on by, first, the shipwreck and then the strange occurrences of their environment. The play is based on the true events of a Virginia Company ship that wrecked in the Bermudas on its way to Jamestown, but because The Tempest was played before publication of the book it was based on, scholars believe Shakespeare read the manuscript and got the story firsthand. Shakespeare presented it in a tale of magic, but how much was he trying to relate the psychological experiences of the sailors he talked to? For such is the elusive nature of PTSD. It is why we can’t fully relate to another person’s PTSD. I admire Margulies’ play for depicting the varying degrees of combat’s psychological impact on individuals, and Twyford’s and McFadden’s talents in portraying some of those degrees, respectively, in Sarah and James. Still, I stress my use of the phrase varying degrees. I personally know several combat veterans, and I cannot apply a single pigeonhole notion of PTSD to any two of them. For this reason I’m increasingly alarmed to hear PTSD in and of itself used as a cause to issue restraining orders, as purpose for abandoning a spouse, and, perhaps most damning, as reason to not hire a vet, singly or as a class (how American commerce and policymakers treat veterans in general is a topic for another discussion). It reminds me (a disability rights advocate) of how in the not-too-distant past our society generally regarded all people with mental retardation as violent, sexual deviants. An individual’s PTSD is an individual PTSD, and in that individual it could even be channeled into a positive. In Time Stands Still, Sarah the adrenaline junky returns to the combat zone (not necessarily a bad thing), and James uses his psychological meltdown experience as impetus to improve his people skills and become a doting father (not at all a bad thing). I also applaud Margulies for using journalists as the protagonists in his study of PTSD, not servicemen and women. For one thing (self-indulgent alert! ), it allows me an opportunity to repeat something I heard Tom Brokaw once say, that journalists and servicemembers are cut from the same DNA.Â Amen! We have the same sense of duty and service, dedicated to community before self out of all proportion with our paychecks. My wife once said about me, “He’s a journalist, the son of a minister, and the husband of an Air Force officer: nobody is devoted to the First Amendment more than he.” (And for those who scoff that I would lay “dedication to community before self” at the feet of certain journalists they see on TV, I reply that I’m not talking about all journalists, nor am I including certain members of the military I’ve seen on TV or have known personally in my otherwise high regard for the vast majority of servicemembers). James (Gred McFadden) slips off into one of his reveries as Richard (Dan Illian) and Mandy (Laura C. Harris) listen in the Studio Theatre production of Time Stands Still. While James' longtime love, Sarah, came back from the war with physical wounds and visible scars from being in an IED blast, James suffered deeper psycholgical wounds from witnessing an explosion that happened earlier in the Iraq War. Photo by Scott Suchman, Studio Theatre. Getting back to the topic of PTSD, Time Stands Still illustrates that it is not limited to soldiers, sailors, airmen, and Marines, that war correspondents are exposed to the exact same conditions. Nor is it limited to the combat zone. Airmen piloting drones over Iraq and Afghanistan from the safety of their cubicles at a Nevada Air Force Base are reporting PTSD symptoms. Police officers, firefighters, emergency medical technicians, and emergency room workers are known to deal with PTSD. A journalist friend of mine who was working the police beat once covered the story of a child who had been washed down a drainage pipe during a thunderstorm. “The lesson I learned,” he wrote in a long letter to me that night when he couldn’t sleep: “You don’t have to watch when they pull the body out.” I assure you, too, that spouses and other family members of deployed servicemembers—wives, husbands and children left home alone—also can experience PTSD-like situations—certainly the stress in that acronym—perhaps even more than their combat-serving counterparts. Time Stands Still also touches on the topic of journalism ethics, especially concerning covering a story without intervening in the story or becoming the story. Mandy is appalled that Sarah didn’t help a victim in one of her photographs; Sarah, meanwhile, seems perfectly at peace with her creed to be a recorder of events, not a participant. Yet, Sarah later questions her own adherence to that creed, and James lives the psychological risks inherent in upholding that creed. This is one of many ways Margulies slyly turns the tables on his journalist protagonists, and the audience, too. The play establishes a clear delineation between the two veteran journalists, well-read (because they have to be) and worldly experienced vs. Mandy, the professional event planner specializing in virtual experiences, whose knowledge of the world comes mostly from nature shows on TV. Mandy could never come close to understanding what’s happening inside Sarah and James, and we saw that played out for almost two hours. But by the end of the play, the smug attitudes of the two journalists get taken down when Mandy reveals her own intensely personal experience—a positive one that contributes to her psychological makeup—that Sarah and James could never grasp without walking in her shoes, no matter how well trained they are in walking in other peoples’ shoes. For journalists so devoted to depicting the evil in human nature, they blinded themselves when encountering pure good in human nature, dissing when not outright dismissing it. But, then, Sarah and James, learn that even with each other, they do not share an understanding of their shared wartime experiences. James ultimately reacts by turning his talents to writing entertainment profiles. Sarah, meanwhile, only reaches understanding and, perhaps, true comfort by viewing the world through a camara lens. PTSD is not a new phenomenon. It is, in fact, for a long time and continuing through tomorrow, an undercurrent of the human condition, just one that has gone by many names over the centuries. Shakespeare may not have dealt with it in his plays 450 years ago, but Sophocles did in his plays 24 centuries ago. Now Margulies with Time Stands Still is dealing with PTSD in this century, portraying many of its facets and applicable dimensions. Here’s hoping the play gets many more stagings in many more theaters reaching much wider audiences for many more years.